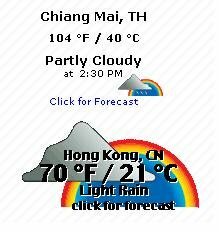 OK, here is another screen shot to show the difference between the temperature in Hong Kong and Chiang Mai! In the words of Gomer Pyle, "Gaw-ly!" Your October 04 blog was extremely boring!